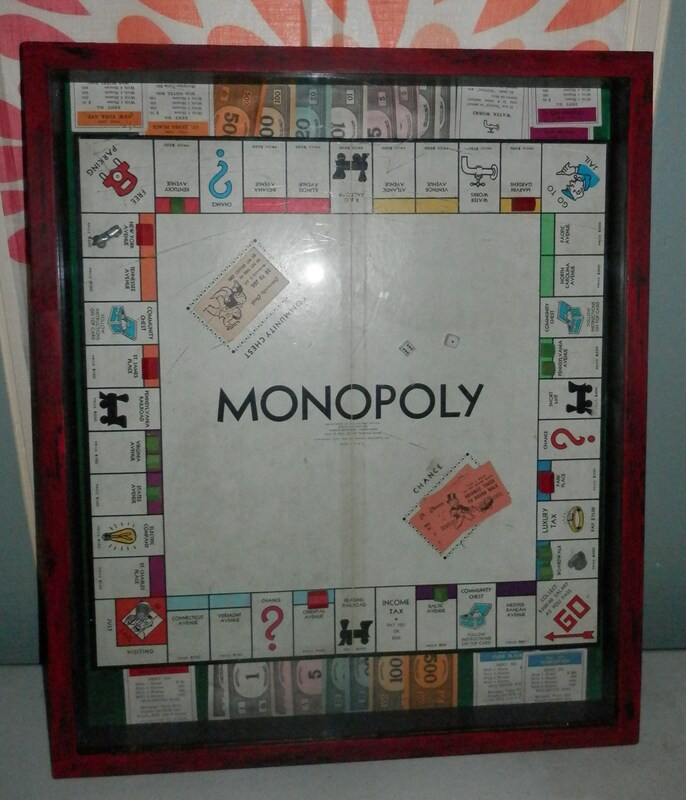 My husband and I bought a 1946 Monopoly game when we were antiquing in Colorado. I love vintage games and am planning on designating an area in our restaurant for displaying games especially since I have a few from my childhood that I can’t seem to part with. I had the shadow box type frame already from an auction a long time ago which worked perfectly. All I had to do was take it apart to take the previous art work out, glue the Monopoly board down and all of the pieces. Since I’ve never been a big monopoly player I enlisted my sister to help me lay out the pieces to where it looked like a game in progress. I called my brother to tell him about this project and to reminisce about the time I played monopoly with him and his friends and they teased me about being put in jail and made me cry. (I think that is why I never really liked the game) The last thing I did was paint the frame the 1st coat black and then the 2nd coat red. So it has a two tone effect – black & red- once I distressed it. Then my husband attached the frame to the back board with his nail gun. Now I just have to get the wall ready that I am going to display this on which includes taking off wallpaper- Ugh! But I am motivated now that I have this 1st game project done. I bought this glass table at a garage sale for a bargain price. It was in need of work and not very attractive. When I got it home the idea popped into my head of making it into a shadow box table. My husband put to use his great woodworking skills and as you can see in the 2nd picture it now has a place to display items. I had to sand some of the rough areas especially the bottom shelf which had some kind of material glued to it. 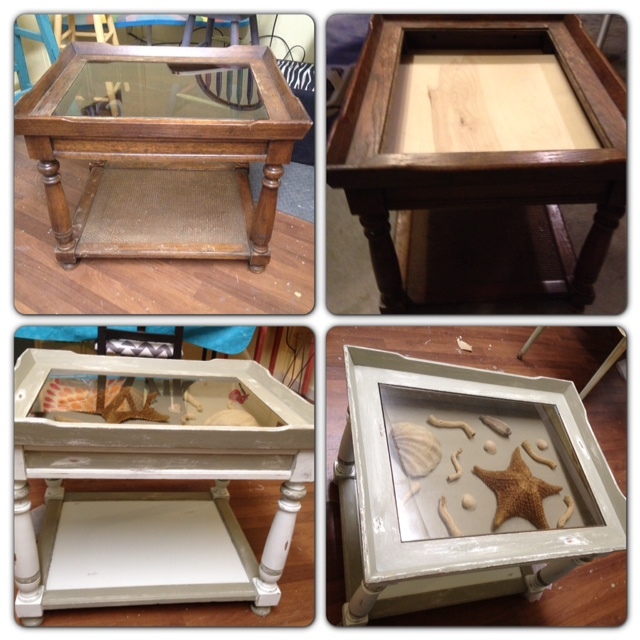 I painted the whole piece a new color I wanted to try – Sherwin Williams Sea Salt using my chalk paint recipe. Next I painted some parts in grey chalk paint, then distressed and waxed it. Notice how some of the sea salt color shows after I distressed it. I put shells in it for now and am going to keep it in my workshop for a while as a show piece. I have always loved shadow box tables and hope to make more of these in the future. I am blessed to have a husband who likes woodworking. We make a great team!